For the first time, researchers have shown that the non-conventional imaging method known as ghost imaging can be performed using a low-cost, chip-based light-illuminating device. This important step toward chip-based ghost imaging could make the imaging method practical for applications such as chip-scale biomedical imaging, light detection and ranging (LIDAR), and internet-of-things sensing devices. "If low-cost, single-chip imaging devices were commercialized it would enable low-cost LIDAR, which is the technology self-driving cars, drones and autonomous robots use to see their environment," said Takuo Tanemura, who led the research team. "Also, small imaging devices could be embedded into smartphones to allow improved 3-D imaging and healthcare monitoring." "Compared with previous implementations of ghost imaging using spatial lightwave modulators that were large and slow (typically operating in the kilohertz range), using an integrated phased array is much more compact and offers lower cost," said Tanemura. "Our approach also has the potential to reach greater than gigahertz operational speeds, or six orders of magnitude faster than SLM-based approaches." To create the random speckle pattern, the researchers applied rapidly changing random electrical signals to 128 integrated phase shifter elements on the OPA. They demonstrated 2-D imaging with more than 90 resolvable points in the X direction (determined by the number of phase shifters) and 14 pixels in the Y direction (determined by the number of wavelengths tested). The results agreed well with theoretical predictions. "This type of imaging device could be particularly useful for LIDAR, which currently produces 3-D images using a bulky mechanical mirror to steer a laser beam," said Tanemura. "It is estimated that the cost, size and response time of LIDAR needs to be reduced by 1 to 2 orders of magnitude to be widely deployed in non-luxury mass-market cars. A chip-scale ghost imaging device could accomplish this." The researchers will continue working to make the new technology even more practical. They are experimenting with electro-optic phase shifters that could increase OPA operation to speeds beyond gigahertz. They also plan to further increase the scan rate and would like to integrate all the optical components on the same chip as the OPA to accomplish 2-D and 3-D imaging without any off-chip components. 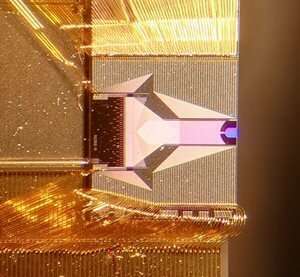 "If we're able to integrate all the necessary components, including the light source and detector, on a chip, then a single-chip ghost imaging device would be possible," said Tanemura.